Natacha Montenegro (Switzerland) served as international UN Youth Volunteer with UN Women in Tajikistan to work as Basic Social Services Officer on a project supporting civil registration in the country. Having volunteered for a decade with several non-governmental organizations in Switzerland, India, Russia and England, she was very happy to join UN Women to try to change the patterns perpetuating gender-based violence against women. According to a recent Oxfam study conducted in six districts in Tajikistan, 96.5% of men interviewed and 71.5% of women consider that women must tolerate violence for the benefit of the family. Needless to say, when I first read this report, only a couple of weeks after I began my assignment, I was shocked by these statistics. A few months later I had the opportunity to contribute to changing these patterns by organising several events for the annual campaign “16 Days of Activism against Gender-Based Violence”. The 16 Days of Activism Against Gender-Based Violence is an international campaign that takes place every year and runs from 25 November (International Day for the Elimination of Violence against Women) to 10 December (Human Rights Day). My colleagues and I started preparing for the campaign months in advance, and we organised several events targeting different audiences: donor agencies, youth and university students, and the public. 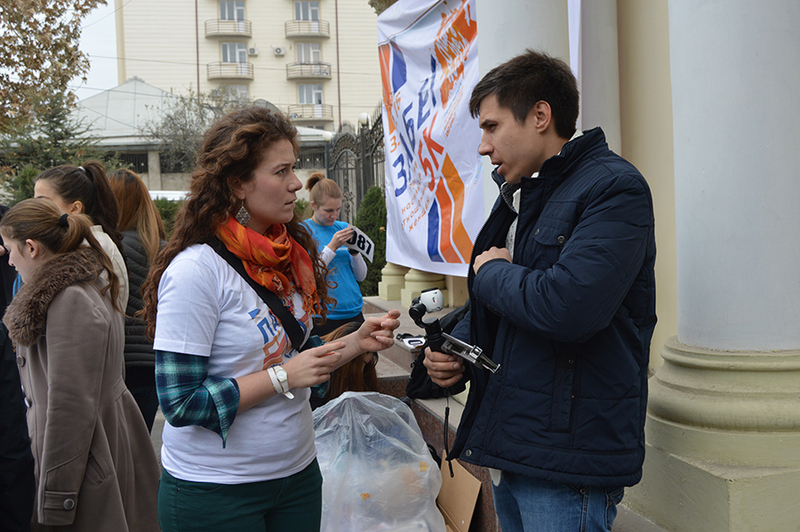 I was responsible for organising one of the largest events – a 5K Run against Gender-Based Violence in Dushanbe. The purpose of the 5K Run was to raise awareness about gender-based violence, while also promoting sports in a country where women do not generally practice sport. Organising this race was a lot of work and sometimes very stressful: fundraising took up most of the time, and two weeks before the event we were not even sure we would have enough funds to organise it. We also needed official authorisation from the administration, which only came at the last minute. Despite all the stress, I very much enjoyed organising the run – I met many people and learnt a lot. I had to find partners, secure funding, contact the authorities, advertise the race, hire volunteers and supervise them, organise logistics for the day of the race, among others. A non-stop race till the starting day. It was the first time that an awareness-raising run was organised in Tajikistan, and it was a great success. We had the support of the Kickboxing and Taekwondo Federations, which gave an energetic warm-up and set the mood for the day. The US Ambassador also participated as a special guest, and spoke about the importance of joint efforts by government authorities, international organisations and civil society to get rid of gender-based violence. With the help of 25 volunteers who worked extremely hard, the run went very well: more than 150 people – men, women and children – participated in the 5K Run against Gender-Based Violence. Many people said they would love to see this becoming an annual event, and I hope more and more people will participate in such events and join efforts to help end violence against women.